Gunjia Pasties are from Northern India, made specially on Holi day, the festival of colour. Do not be put off by the long list of ingredients. Once you have made the dough and the filling, the pasties are not very difficult to put together. You can adjust the stuffing ingredients to your own taste. Gunjias are shaped like Cornish Pasties. Makes approximately 30. 250 gm. Khoya or Mawa 1 / Khoya or Mawa 2, solid condensed milk. It can be bought ready-made, from the Indian sweet shops or grocers. 25 gm. chironji nuts (chiroli in Gujrati), chopped. Buy from Indian grocer. A handful of peeled melon seeds or pine kernels, available from Indian grocer. Measure all ingredients for filling & keep aside. Chop raisins roughly. This avoids them bursting during frying. Mash or grate khoa or mawa in a bowl. If shop bought (not freshly made at home), fry in a hot wok without adding oil/ghee, until it turns pink in colour. Remember to keep stirring all the time. Allow fried khoa to cool completely. It sets a little when cool. Crumble khoa and add all other filling ingredients to it. Mix well. If using milk powder instead of khoa, do not fry it. Simply add it to all other filling ingredients along with one or two tsp. of fresh milk to 'bind' the ingredients together. Rub oil & salt into the flour. Add water and make a medium firm dough (firmer than chapatti dough and softer than Mathari dough), by kneading it thoroughly. You can use your electric dough maker or bread maker for kneading. Keep aside covered for 1/2 hour or so, preferably in a fridge. Make glue by dissolving 2 teaspoons of flour in 1 tablespoon of cold water. Keep aside. Divide dough into1 inch diameter balls. Roll each ball out into a 10-12 cm. diameter and 2-3 mm. thick circle/roties. Place this roti in a pasty/gunjia maker or in the hollow of your palm. Moisten the edge of half the circle with flour-water mix or glue. Spoon in 1 to 1 1/2 tbs. of the filling mix in the centre and fold the pasty maker over the filling. Seal the edges by pressing the pasty maker gently. Remove extra dough outside the seal. If making by hand, support the filled roti on the left hand, fold it over and press and pinch the edges together, between first finger and thumb. Keep covered with a moist cloth, until you have a batch of 5-6. Next batch can be prepared while previous one is frying. *See Notes. Heat the oil to medium hot. When ready, a test piece of the pastry dropped into the oil should sizzle and rise to the top slowly. It is important to fry the gunjias slowly, otherwise they get soggy as they cool. On the other hand, if you fry them in oil that is not hot enough, they will absorbs too much oil. So, getting the temperature right is important. 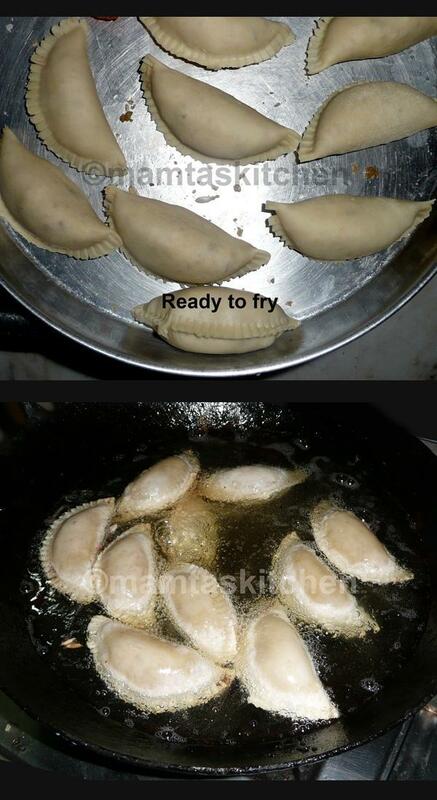 Fry a 5-6 gunjias at a time, until golden brown in colour, but not dark brown. Make sugar syrup of 2 wire consistency by boiling the sugar and water. Right consistency is reached when a drop of the syrup stretched between a forefinger and thumb results in 2 wires stretching out. Keep it warm on minimum heat. Immediately after frying, lift the gunjias out of the oil and put them in the syrup. Turn over quickly, to coat all sides, take out and cool on a wire rack. Cool and store in an airtight box. 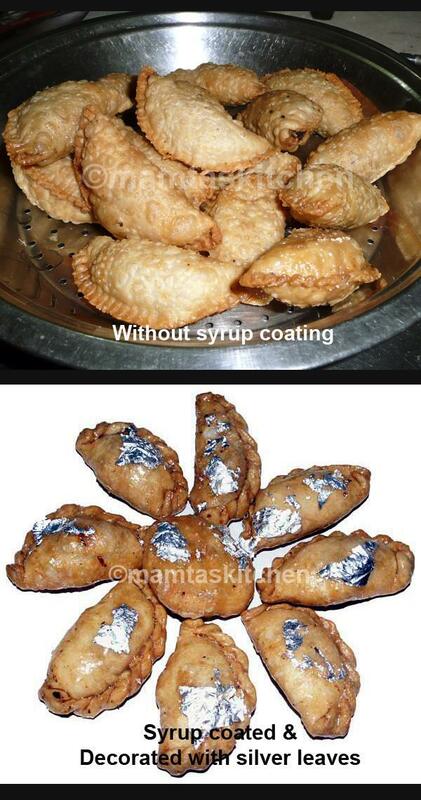 Remember that gunjias do not have to be covered in sugar syrup, especially if you want to keep the sugar content low. Serve at room temperature. Store when completely cool, in an airtight container to keep the moisture out. For special occasions, cover with silver leaves, but make sure they are silver and not some other metal sold as silver. Roll one ball on a greased surface into a 7-8 inch circle. Cut it into half. Take one half of the circle at a time in your hand. Dip your index finger in the water flour mix and apply it to one half of the straight edge of the semi circle. Overlap the other half of the straight edge, making a cone. Press and seal. Stuff with 1 tablespoon of the stuffing mix, press open edges gently to give a good seal. 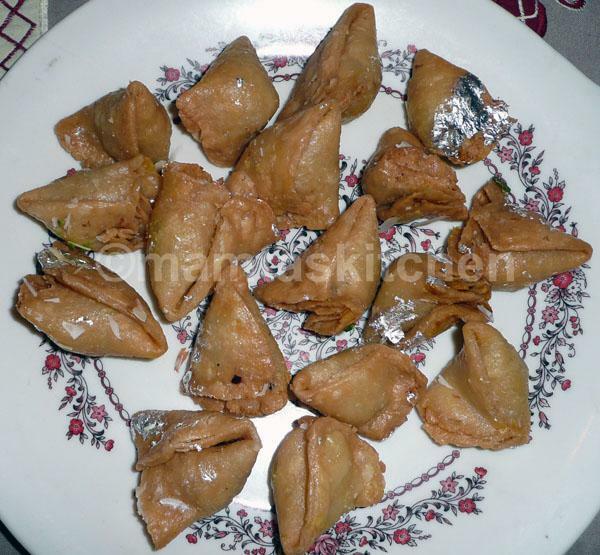 Make all samosas like this. Keep them covered with a moist cloth. If pastry is allowed to dry, it is more likely to burst during frying. Fry and coat with syrup as above. Before serving, you can decorate them with sliver 'varak', thin film of edible silver.